While the origins of this famous and popular (and rubbish) ‘dance’ have long been disputed between Canadians (who for some odd reason call the song the Hokey Pokey… but then again they are kinda strange, egh?…) Europeans, and our American friends (who naturally have the most outlandish claim…) this newly uncovered evidence leads to the undisputed conclusion that it was the great bard himself who penned the ditty between sonnets and plays. You can see from the style of this original that there can be no question of its authenticity. In a more animated account in about 1870’s Robert Wright wrote of the “gang” in Dodge City, Kansas using “hokey-pokey” which was actually bisulphite of carbon. It was administered as a bad joke to “any animal with hair, it has a wonderful effect. For the time being, the animal just went crazy…”. While perhaps not the origin of the word, this certainly accounts for perhaps some words to the dance “shake it all about”. 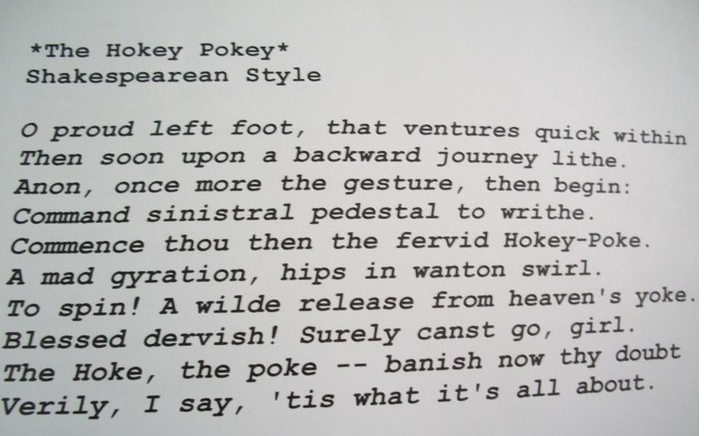 And perhaps the best (well more bizarre even than a bisulphite of carbon theory) was proposed by the Anglican Canon Matthew Damon, Provost of Wakefield Cathedral, in God’s own County of Yorkshire, who claimed that the dance as well comes from the Catholic Latin mass. Obviously… The priest would perform his movements with his back to the congregation, who could not hear well the words, nor understand the Latin, nor clearly see his movements. So there you have it. More things you never thought you wished, or needed to know. And now know that you didn’t.